The Niagara Falls PowerHawks are riding a five game winning streak as they prepare to host a trio of games this weekend at the Hyde Park Ice Pavilion. 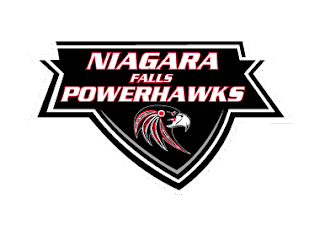 After a 6-3 victory over Roc City last Friday at the Lakeshore Ice Arena, the PowerHawks will host the rematch Friday evening. The PowerHawks will then host the Skylands Kings on Saturday and Sunday. Game times are set for 7pm Friday, 6pm Saturday, and 1pm Sunday. The PowerHawks have gone 6-3-0-1 over their last ten games to earn 13 points. They sit in second place with 36 points, 11 points ahead of Skylands. With games winding down for the season, the contests between Niagara Falls and Skylands will be an important pair of games. The PowerHawks could tighten their grasp on second place, or Skylands could eat away at the difference between them. After the loss to Niagara Falls last Friday, the Royals visited Binghamton where they fell 15-0 to the Junior Senators on Saturday. Sunday extended their road trip to New Jersey where they faced off against the Skylands Kings, resulting in a 5-3 loss. It was the Kings’ only game of the weekend. Skylands will be in Binghamton on Friday night. The Royals will play a home and home against the Oswego Stampede Saturday and Sunday.